Hey Guys! What's happening? This is the second episode of the series called Absolute Youtuber. Absolute Youtuber is a series where I interview my and your favorite Youtubers and put them in this blog. So if you want to see your favorite Youtuber or YouTube channel to be interviewed by me, then you can leave a wall post on my Facebook Page. 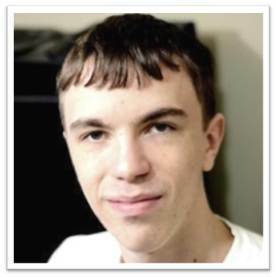 This time we have Austin Evans popularly known as Duncan33303 on YouTube. He makes high quality technology related videos. His videos are short, informative and enjoyable. My favorite part of his videos is when he says "Hey guys this is Austin"! He is young talented guy and you should definitely subscribe to his YouTube channel if you haven't done it yet. So as of now, lets look at his YouTube stats and figures. He has some popular playlist of videos like "What to Expect" , Gaming PC Builds and Top 5. He uploads videos frequently so do check him out. As far as the interview is concerned, here is how it went. -Hi! My name is Austin Evans, better known online as duncan33303. I'm a technology video producer on YouTube where I do gaming PC builds, smartphone reviews along with most anything to do with tech. -Back in 2009 I was writing for a website run by my friend doing written reviews of iPhone apps. He was fairly big on YouTube at the time and suggested I try making video versions of my reviews so I gave it a shot and everything went from there. What is the story behind your username "duncan33303"? -Back when I was around 10 years old or so my friend and I were getting on the internet for the first time and decided to come up with internet aliases to be 'cool'. Mine was duncan which eventually turned into duncan33303 which was what I used when I created my YouTube channel back in 2007, never really planning on making videos with it. Once I did start making videos a couple years later and realized the channel was doing reasonably well I considered changing it but back then the only way to change the username was to start a new channel and lose the small audience I had accumulated to that point. What was the best comment you ever received that made you feel awesome! -That's a tough one, I've had lots of awesome comments over the last few years. Anytime I get a long comment from someone that really spends time on it I'm always happy, I love it when my videos are a two way street as opposed to me just throwing information at the viewer. -At this point I've got quite a few fairly regular series such as my gaming PC builds, What To Expect, Top 5s and Tech I Like that usually ideas aren't difficult to find. There's almost always new tech coming out or some topic that I can make a video on. -Ecstatic, probably one of the best days of my life. I had been grinding out videos for a year by then and I really hadn't told anyone I was even doing YouTube. When I finally got my first check I proudly showed to my friends and family and explained to them how I could make doing videos an actual job. -I'm addicted to Vsauce, not only is Michael amazing in front of the camera but he also blows my mind with basically every video. I also enjoy watching tech videos of course, some of my favorite channels are MKBHD, tldtoday, Film Riot, UnboxTherapy and LinusTechTips. Name your favourite song and movie. -Strobe by deadmau5 and the first Back to the Future. -I can never settle on one phone for long but right now I'm using the HTC One and a Galaxy S3 on the side. What are the devices that you use for making your videos? -I use a Nikon D600 to record almost all of my videos with a few microphones depending on the shoot and everything is edited in Adobe Premiere and After Effects CS6 on my custom built editing PC or a MacBook Air 11" depending on if I'm on the go or back at the office. -Not really, YouTube has been incredibly good to me these last four years so I plan on continuing what I'm doing now and just making it better and better. -Enjoying every second of it. -Hard work is 100% what got me to where I am today. It took me three years of working on the channel almost every day before it really started to take off so if there's something you're passionate about put the time in! It'll pay off eventually. I must say its very difficult to achieve such a huge subscribers list when your genre is technology as most of the popular channels on YouTube are related to comedy. I congratulate him on his success and wish him all the best in his YouTube career. Did you like the interview? Do have have any questions for Austin? Leave your thoughts and questions in the comment section below. Also share this on Facebook or Twitter with your friends and families. So tell me, whom do you want to see in the next interview? Leave a wall post on my Facebook Page and you will be given credit for your suggestion if we get to interview that person.